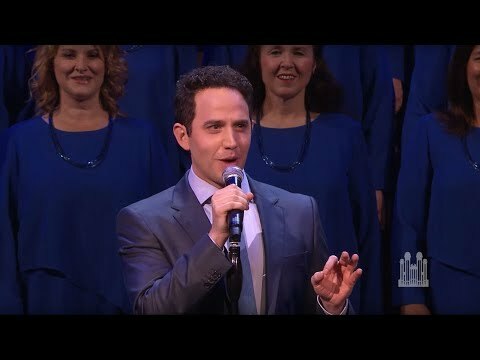 The Mormon Tabernacle Choir experienced a first at the annual Pioneer Day Concert July 18 and 19 when Santino Fontana, known for his role as Hans in "Frozen," led them in a medley that included Pharrell Williams' song "Happy." Fontana introduced the medley, which was the concluding number, by saying that he didn't want to leave Salt Lake City on a sad note, according to the Deseret News. "I wanted to do something that was a first for this venue. I think the choir will agree with me that this fits the bill," Fontana said. The medley also included songs like "Sing Happy" from the Broadway show "Flora the Red Menace"; "I Want to Be Happy" from "No, No, Nanette"; "Happy Talk" from "South Pacific"; and "Get Happy" from the film "Summer Stock." The Mormon Tabernacle Choir posted the song to YouTube July 21. Pharell Williams' "Happy" starts at 5:02.